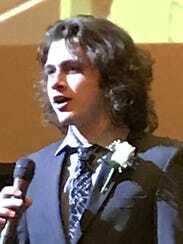 Henderson’s Deegan Lawrence was awarded the Kentucky Boy's Scholastic Achievement award at the United States Tennis Association of Kentucky’s annual awards and honors dinner and reception on January 26 at the Louisville Palace. 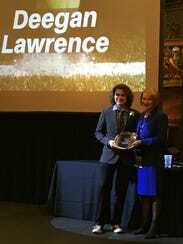 Lawrence has received the Governor's All-State Academic Award for the past four years. He is a member of the Henderson County High School academic team, which won the 2017 state championship. He has a 4.0 grade point average and scored a 34 on the ACT college entrance exam with a perfect 36 in math. Lawrence is currently attending the Gatten Academy at Western Kentucky University. Lawrence also has an impressive tennis career. He has played for the Henderson County High School tennis team since he was in sixth grade and won the 2014 Joe Creason Tournament Sportsmanship Award. He helped with the Junior Team Tennis program and assisted with youth summer lessons. Lawrence was appreciative of those who supported him. "I am thankful for my parents, family, coaches and friends who have guided me. It was an honor to be selected for this award among an excellent group of nominees," he said.